Want to save a life before the end of December? Do yourself a favor and keep reading...your minding your own business at your company holiday party and someone starts to choke. What the hell do you do now? If you freeze, don't worry. You won't be the only one. It's a natural human reaction to freeze in an emergency. This is why certain industries train people to be calm specifically during crisis. It takes training. Ok...so now you've unfrozen and Michael is still choking on that giant piece of steak he decided to inhale. Thanks Michael. See the picture below on how to perform the Heimlich maneuver properly. Typically, a person choking won't be able to talk, they will have odd breathing noises or they're starting to turn blue. In the extreme cases this can lead to the person to pass out. This is all a direct result of the person’s inability to get air into their lungs and deliver oxygen to the the body (specifically the brain). The universal sign is someone having their hands clutched on their throat. 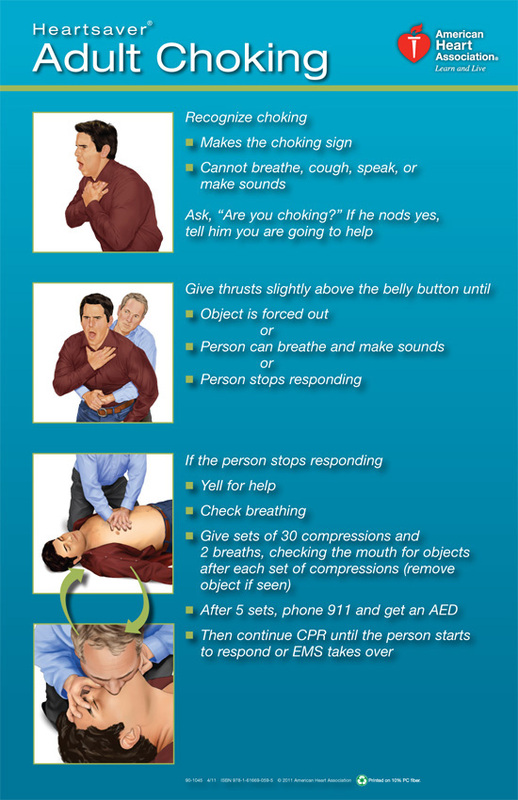 There are a few steps you should Take when someone is choking. The American Red Cross has "Five & Five" approach to deliver aid to a choking victim. 2. 5 attempts at the Heimlich maneuver. Stand behind the person with one hand in a fist and the other grabbing the fist and pull in and up just above the person’s belly button. If it doesn't work after 5 attempts, try another 5 times before going back to back blows. If the patient is obese or pregnant, put your hands a little higher. 3. You should the alternate between 5 back blows and 5 attempts at the Heimlich maneuver. 4. If the patient becomes unconscious, lower them to the floor. If you can see food or an object in the back of the throat you can try to reach in an grab it. DO NOT DO A FINGER SWEEP (blindly sticking the finger in the back of the throat if you can't see anything). 5. Start CPR if an object is still stuck and the patient is not responding. Repeat this sequence of 5 back slaps and 5 chest thrusts until the child responds. Start CPR if the child doesn't stop breathing. If the person choking is a child less than 1 year old, place the child face-down on your forearm and slap the back 5 times in the middle of the back using your palm. If this doesn't work, flip the child over and using 2 fingers press on the center of the child's chest with 5 quick compressions. DON'T FORGET TO LIKE AND FOLLOW US IF YOU ENJOY READING THESE KIND OF ARTICLES. WE NEVER SPAM. WE ARE HERE TO INFORM AND ENTERTAIN.